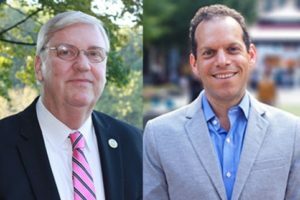 The first fundraising results of the 2018 election cycle are in, and, amid the crowded field of Democratic candidates for County Council at large, one of the early winners appears to be the county’s new public campaign finance system. To be sure, reports filed this week with the state Board of Elections show an at-large council candidate who opted not to use the public funding system, veteran Del. Charles Barkley of Germantown, with the largest campaign war chest—more than $233,400 as of the Jan. 10 cutoff date for the reports. But Barkley, seeking a move to Rockville after 20 years of serving in Annapolis, had a major head start over the other candidates thanks to past fundraising; he began 2017 with nearly $205,500 in the bank. Meanwhile, with a little more than five months to go until the June 26 primary, the other five candidates besides Barkley who reported campaign treasuries of at least $100,000 all are participating in the public campaign funding system that the County Council enacted three years ago. It would appear to underscore arguments by advocates of the system—that those tapping into public funding can be financially competitive, despite having to limit contributions they receive to individuals donating no more than $150 apiece. Another key takeaway from the reports, which were due at midnight Wednesday and cover virtually all of 2017: The gargantuan field of Democrats competing for the four at-large nominations seems likely to thin out as the contest enters its homestretch. The reports show that about one-third of the 27 Democrats currently filed in the at-large race are lagging far behind the leading fundraisers. It raises the question of whether some of these candidates will be able to raise enough to qualify for public funding, or, alternatively, take in enough in private donations to be competitive. To qualify for public funding, an at-large candidate must raise at least 250 donations of $150 or less, totaling a minimum of $20,000. The candidate can receive up to $250,000 in public funding, depending on how much he or she is able to raise in eligible matching donations. federal contractor Hoan Dang of Silver Spring ($109,800). Not far behind was former Obama administration official Ashwani Jain ($93,800), who, like Barkley, is relying exclusively on private fundraising. Conway, Dang, Glass, Riemer and Wilhelm are the five Democratic at-large contenders who have received public funding to date, although at least another five appear poised to join them in the near future. That group—which includes Montgomery County Department of Recreation Director Gabriel Albornoz of Kensington, community advocate Shruti Bhatnagar of Silver Spring, former Takoma Park Council member Seth Grimes, former Obama administration official Will Jawando of Silver Spring, and management consultant Mohammad Siddique of Montgomery Village—have filed paperwork indicating they have raised enough in eligible private donations to receive public subsidies. Barkley, who has chaired the House of Delegates Economic Matters subcommittee with jurisdiction over alcohol the past eight years, reported raising $50,500 over the past year—with a significant portion of that coming from alcoholic beverage interests. Nearly one quarter of what Barkley raised came from two individuals: $6,000 apiece—the maximum donation allowed under Maryland law—from June Trone and Anna Marie Trone, both of Potomac. They are the wives of David Trone and Robert Trone, respectively. David Trone, now a candidate for Congress, is co-owner with his brother Robert Trone of Total Wine & More, a nationwide retailer of beer, wine and liquor. Marilyn Balcombe of Germantown—who also opted not to go the public funding route—raised almost as much as Barkley last year: $49,670. Balcombe, the president of the Gaithersburg-Germantown Chamber of Commerce, attracted financial support from several members of the county’s development community. Among her contributors: Andrew Chod of Minkoff Development and Charles Nulsen of Washington Property Co., each of whom donated $2,000. Another prominent developer, Robert Buchanan of Potomac, gave $1,500. Balcombe also reported a $500 contribution from current at-large County Council member Nancy Floreen of Garrett Park, who is not running again due to the 2016 term limits referendum. Jain, a 28-year old first-time candidate, raised nearly $133,000 relying heavily on the Indian-American community both inside and outside the district. More than a quarter of what he took in appears to have come from his parents and members of his extended family. In addition, technology firm executive Sanjay Govil of Potomac donated the $6,000 maximum to Jain’s campaign, as did Govil’s wife. The Govils also hosted an October fundraiser featuring Jain’s onetime boss in the Obama administration, former U.S. Housing and Urban Development Secretary Julian Castro. Yet another candidate who chose to rely on private donations, Montgomery County procurement director Cherri Branson, struggled to raise money, according to the latest disclosure reports. Branson, who spent a year on the council in 2014 representing District 5 after being appointed to fill a vacancy, took in only $2,000 in contributions. She reported $12,000 in loans to her campaign. Under the public finance system, that is the maximum amount a candidate and his or her spouse can lend to the campaign committee. Among the candidates participating in public financing, Riemer reported receiving or qualifying for more than $163,800 in public funds. Combined with private individual donations—each $150 or less—totaling $55,300, his campaign reported receipts of $219,100. Among the non-incumbents who have qualified for public funding, Conway was just behind Riemer, with almost $215,900 in total receipts. This includes $140,100 in public funding that he has received or qualified for, along with $63,770 in private donations and a $12,000 personal loan to the campaign. Glass, who lost a close race for the District 5 Democratic nomination in 2014, reported receipts totaling about $157,700, including $116,275 in received or pending public funds, $38,285 in private donations, and a $3,150 loan. Close behind was Dang, a former chair of the Maryland Democratic Party’s Asian American and Pacific Leadership Council. He took in $156,500, including $104,500 in public funding and nearly $52,000 in contributions. Wilhelm reported taking in more than $134,100, including $98,320 in public funds, along with nearly $33,620 in private contributions and $2,200 in loans. Albornoz, who has raised about $33,900 in contributions, is poised to receive nearly $85,000 in public funds to replenish an almost depleted campaign treasury. Bhatnagar is awaiting close to $90,000 in public funding after reporting $21,630 in contributions and $13,820 in cash on hand. Grimes has requested more than $73,000 in public funding, based on private donations of nearly $23,900. He reported $18,450 in his campaign treasury. Jawando is awaiting almost $96,800 in public funds triggered by total contributions of nearly $38,670. He reported $21,550 in his campaign treasury as of Jan. 10. Siddique, who had less than $1,000 in cash on hand as of that date, has filed for a total of $75,200 in public funds. He has raised nearly $25,600 in private contributions. While they have yet to file, two other candidates—science consultant Danielle Meitiv of Silver Spring and activist Brandy Brooks of Wheaton—appear close to qualifying for public funding. Meitiv, currently a member of the Montgomery County Democratic Central Committee, has raised about $22,000 in outside private donations, not including a $12,000 loan to the campaign. She reported about $20,120 on hand. While Brooks—whose report was not filed with the Board of Elections until Friday morning—showed less than $1,000 in cash on hand as of Jan. 10, she reported raising more than $18,900 in contributions, not including loans totaling $450. Neil Greenberger of Damascus, who until last year was the spokesman for the County Council, reported $15,300 in his campaign treasury. But Greenberger has raised only $6,830 in private contributions, supplemented by $12,000 in loans—the latter of which cannot be used to trigger public funding. Of the 27 Democrats who have filed for council at large nominations, 26 had filed the required campaign finance reports by Friday morning. At presstime, a report for the remaining candidate, construction manager Darwin Romero of Silver Spring, had not yet appeared on the Board of Elections site.